How Can You Tell If Your DVR is Supported? - DME Forensics Inc.
How Can You Tell If Your DVR is Supported? Home DVR Examiner How Can You Tell If Your DVR is Supported? One of the most common questions our technical support team receives is “Is my DVR supported by DVR Examiner?”. 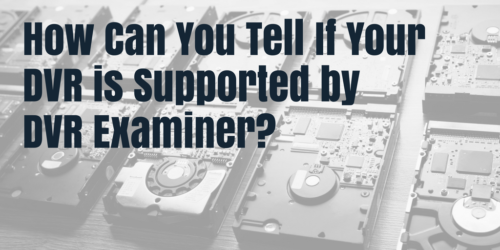 Unfortunately, even though DVR Examiner is simple, the answer to this question isn’t. We certainly keep records of all DVR makes/models that we’ve tested internally in order to implement them within DVR Examiner. However, since there are thousands of different models of DVRs constantly being manufactured, the number of DVRs we are able to test is a fraction of the number of potential makes/model that exist in the wild. Fortunately, DVRs of all different makes, models, shapes, and sizes use the same internal components which result in the same format and organization of data being written to the hard drive. DVR Examiner recognizes all of these systems and is able to process them the same, even though we only physically tested one specific device for this particular type of DVR. We also ask for user feedback (“I tried this model and it worked”, or “This device didn’t work for me in version X.X”). Using this information, we have developed an internal database of what types of system are (or may be) supported by DVR Examiner. The issue we’ve always struggled with is that this database will NEVER be complete. There are many systems we’ll never hear about that work perfectly well within DVR Examiner, and in addition, many systems don’t even have a make/model to classify them by. Finally, many systems are overly generic in their models (how many different ways can we include “H.264 Digital Video Recorder”?). Our goal is to make this information available to users at some point in some fashion, however we are still working out the details. The last thing we want is for someone with a DVR to check the database, not find their particular system, and not try DVR Examiner even though it may very well be supported. We want to balance that risk while still making as much information available as possible. So what should you do in the meantime? Try it! One of the main reasons we offer a free trial is to allow you to try DVR Examiner using the device and data from your case. If you’ve used a free trial in the past and want to try the latest version, reach out to us and we can help. DVR Examiner is constantly being updated with support for additional DVRs, both new and old, so if you’ve tried it in the past and it didn’t work for a particular system, definitely test out our newest version. Thank you for your support of DVR Examiner!